I got drawn into the Indie polish craze quickly. I was just in awe about how amazing some of these polishes are. Like nothing else you can buy in any store. I was immediately caught up in matte glitter but have expanded into others over time. I also have been watching (at a safe distance) the controversy in the indie polish community. There are some Indie Polish creators that have turned me off completely and I don't intend to purchase their polish. Some, however have proven to have great products and fantastic customer service. 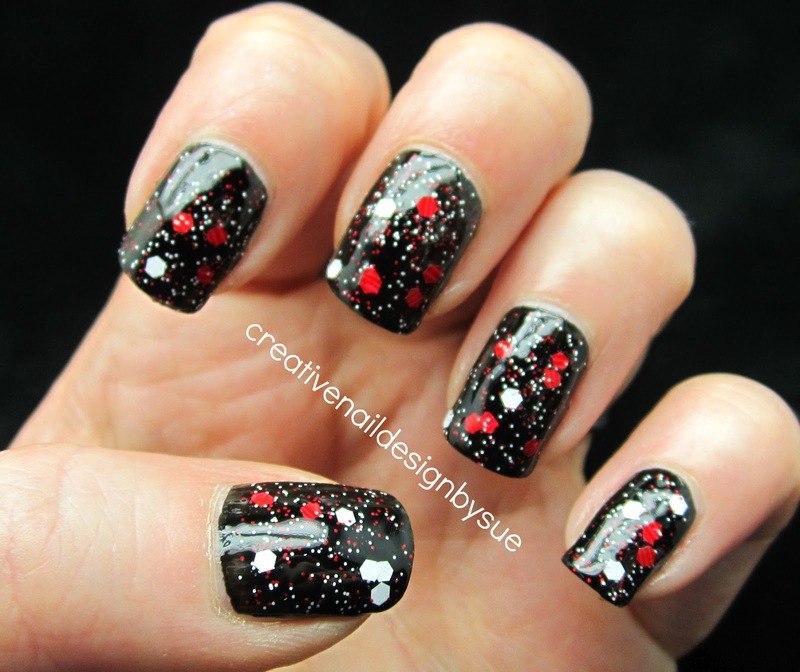 here is one of them....Amy from Amy's Nail Boutique. This is Gingham layered over Liquid Leather. This is a bit thin with glitters, which I tend to prefer. Sometimes too much glitter is hard to apply. It gives you the option to go light and see the beauty of the polish beneath. Or you can just add more layers. This was two layers. The glitters placed on there own and without any fishing from the bottle. Gorgeous. 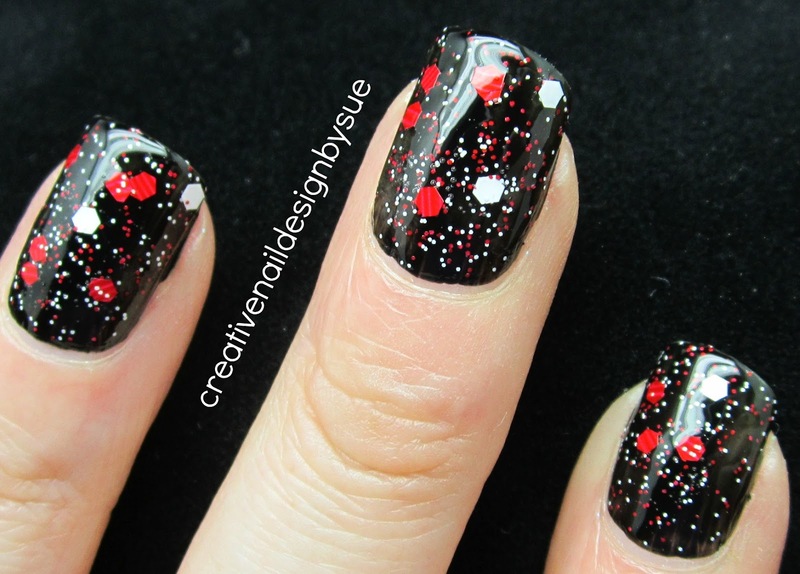 Just red and white glitters in two sizes. Loving these textured glitters now. They remind me so much of Ruffles potato chips. 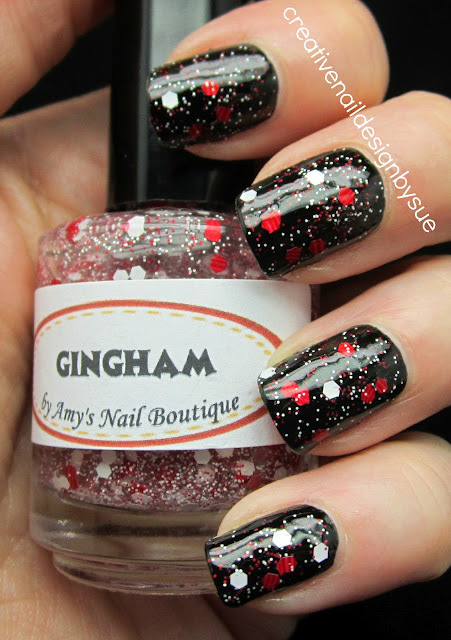 You can find Amy's stuff at her Etsy store called Amy's Nail Boutique. This is stunning, especially over black! OMG! Love, love, love this! Oooo never saw this before, I am liking it! That is such a pretty color! I love it! It reminds me of vegas and blackjack. I have been away for 3 days and have missed so many of your posts. Hope I dont miss any of them. This is a gorgeous polish. I've gotten 3 polish from Amy, 2 custom and one Lemon-Lime. She is sooo sweet and her polish is amazing! I haven't seen this one on her Etsy shop yet, love it! !